1. When did Dickens family move to London? 2. What did Dickens do at a Blacking Factory? 4. What career did he begin in 1831? 5. What inspired his writing when visiting America? 6. What piece of work could he save from the wreck carriage of a train? 7. What did he die of ? 8. What church is he buried in? If you want to play a game on Dickens's life, just click here. Charles Dickens had a pet raven named Grip. When the bird died in 1841 he had it stuffed and it is now in the Free Library of Philadelphia. As a young man Charles Dickens worked for nearly four years as a newspaper reporter working on court cases and legal proceedings. This experience found its way into many of his books. Charles Dickens and his wife Catherine had ten children. Many of them were named after famous writers. Many of Charles Dickens' books were printed in magazines in serial form before being published in book format. Unlike other authors who finished their stories before the magazines printed them, Dickens often wrote each episode as they were being serialized. This meant that his stories had a rhythm which kept the reader looking forward to the next episode, just like a modern day TV series. One of Charles Dickens' daughters was named Dora after the character in his book David Copperfield. The real Dora died tragically of an illness just like the Dora in the book. Dickens received six shillings a week for his work. This link is useful for the equivalence with present day money. Soon Dickens was commissioned to write burlesque sporting sketches; the result was The Posthumous Papers of the Pickwick Club (1836–37), which promptly made Dickens and his characters, especially Sam Weller and Mr. Pickwick, famous. In 1836 he married Catherine Hogarth, who was to bear him 10 children; the marriage, however, was never happy. Dickens had a tender regard for Catherine's sister Mary Hogarth, who died young, and a lifelong friendship with another sister, Georgina Hogarth. The early-won fame never deserted Dickens. His readers were eager and ever more numerous, and Dickens worked vigorously for them, producing novels that appeared first in monthly installments and then were made into books. Oliver Twist (in book form, 1838) was followed by Nicholas Nickleby (1839) and by two works originally intended to start a series called Master Humphrey's Clock: The Old Curiosity Shop (1841) and Barnaby Rudge (1841). Dickens wrote rapidly, sometimes working on more than one novel at a time, and usually finished an installment just when it was due. Haste did not prevent his loosely strung and intricately plotted books from being the most popular novels of his day. When he visited America in 1842, he was received with ovations but awakened some displeasure by his remarks on copyright protection and his approval of the abolition of slavery. He replied with sharp criticism of America in American Notes (1842) and the novel Martin Chuzzlewit (1843). The first of his Christmas books was the well-loved A Christmas Carol (1843). In later years other short novels and stories written for the season followed, notably The Chimes and The Cricket on the Hearth. Dickens lived in Italy in 1844 and in Switzerland in 1846. Dombey and Son (1848) was the first in a string of triumphant novels including David Copperfield (1850), his own favorite novel, which was partly autobiographical; Bleak House (1853); Hard Times (1854); Little Dorrit (1857); A Tale of Two Cities (1859); Great Expectations (1861); and Our Mutual Friend (1865). In 1856 he bought his long-desired country home at Gadshill. Two years later, because of Dickens's attentions to a young actress, Ellen Ternan, his wife ended their marriage by formal separation. Her sister Georgina remained with Dickens to care for his household and the younger children. 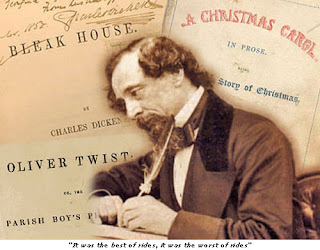 Dickens was working furiously, editing and contributing to the magazines Household Words (1850–59) and All the Year Round (1858–70) and managing amateur theatricals. To these labors he added platform readings from his own works; three tours in the British Isles (1858, 1861–65, 1866–67) were followed by one in America (1867–68). When he undertook another English tour of readings (1869–70), his health broke, and he died soon afterward, leaving his last novel, The Mystery of Edwin Drood, unfinished. His grave is in Westminster Abbey. Charles Dickens is one of the giants of English literature. He wrote from his own experience a great deal: the Marshalsea prison dominates Little Dorrit, and his father was at least partially the model for Mr. Micawber in David Copperfield. Although he was expert at journalistic reporting, he wrote nothing that was not transformed from actuality by his imagination. Sharp depiction of the eccentricities and characteristic traits of people was stretched into caricature, and for generations of readers the names of his characters, Mr. Pickwick, Uriah Heep, Miss Havisham, Ebenezer Scrooge, have been household words. His enormous warmth of feeling sometimes spilled into sentimental pathos, sometimes flowed as pure tragedy. Dickens was particularly successful at evoking the sights, sounds, and smells of London, and the customs of his day. He attacked the injustices of the law and social hypocrisy and evils, but after many of the ills he pictured had been cured he gained still more readers. Some critics complain of his disorderliness in structure and of his sentimentality, but none has attempted to deny his genius at revealing the very pulse of life. If you still want to know more about Dickens's life check on his web page. If you want to join any of the celebrations on his anniversary, just click here. Why not reading his books? An entire collection of his works is accessible online. The Charles Dickens Museum from martinib.eu on Vimeo. Teaching English by Fran| Shakespeare.